More Work for Mother – The Bookshelf of Emily J. 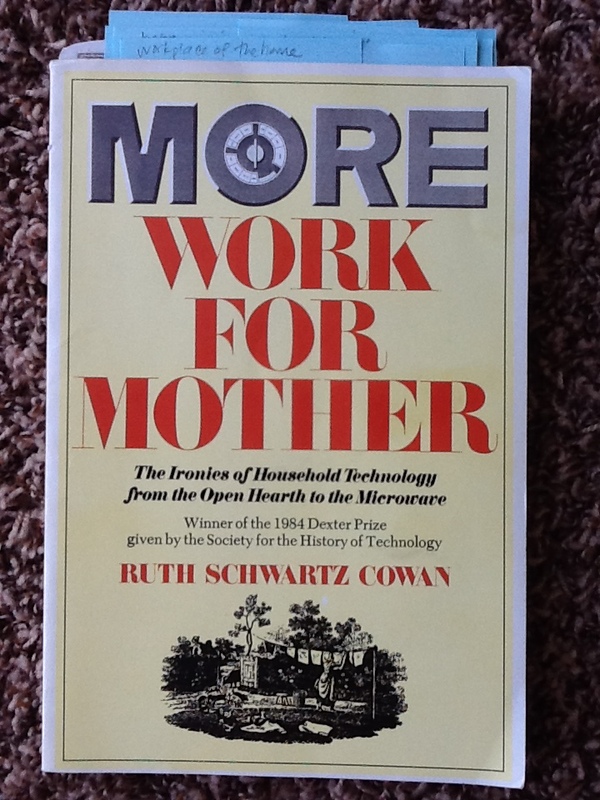 A social rhetoric surrounding household technologies, such as the dishwasher, is that these devices are “labor-saving.” Ruth Schwartz Cowan (1983) argued that this assumption of technology, especially technologies made for domestic work, is wrong. She instead posited that so-called labor-saving devices have actually increased work for women. Cowan traced household technologies in detail from industrialism, through the great wars, and into the postwar years. Before looking at these eras closely, she examined the general tools and conditions of pre-industrialism. This was necessary to her research because industrialism is generally seen as the catalyst that made housework lighter, easier, and less time consuming. Yet as technologies emerged to improve and streamline household chores, work moved from being shared among family members and hired to domestic servants to solely resting with the housewife. Suburbia contributed to this, by causing men to travel long distances for work and requiring that somebody (the wife) stay at home to work and maintain technological systems and to care for children. In outlining the state of housework, Cowan recognized that technological systems are socially constructed and maintained. “We live in isolated households and do our marketing for the tiniest consumption units; but, to get our bread to the table, we still need bakers, agribusiness, utility companies, and stove manufacturers” (p. 6). In this sense, housework resembles market labor, yet women are not considered to be producers or to perform any measurable labor. Housework is seen as consumption, which contributes to the view that time and labor are being saved. This is a fascinating read on the history of technology, especially as it applies to women and the workplace of the home. Emily, the overarching truth is technology has enslaved us further and we have to fight like hell against that tide. We are connected to work well into the night, weekends and vacations. We feel obligated to return immediately a text, so as not to offend. We do more things at the last minute, bordering on rudeness, in accepting invitations, then backing out when we have a better opportunity or the people we want to be there are not. As for dishwashers, people tend to wash the dishes before putting them in the dishwasher. So, you in essence do the work twice. When I do the dishes, I save the dishwasher for plates, knives and glasses and wash the bigger stuff by hand. By the way, there is an old joke that is more true than not. A man will never be killed while washing the dishes. We need to unplug more. We need to not hurry to places to do nothing. We need to stop and smell the roses, hear the birds, take in the scenery. And, we need to not allow technology to rule us. It is just a tool. So, don’t be a tool while using it. Well written and said! You are reiterating many of the class discussions I’ve had about technology and determinism over the last two years or so. Yes, cell phones are awesome, but it means we work longer and harder. They definitely keep us tied to systems and corporations. And social networks keep us tied to each other, but at what cost? Does that mean those connections are healthy or beneficial? This book seems to be just the beginning of interesting and critical conversations about technologies and their consequences. So much has been done since then, and I suspect many scholars explored these issues before Cowan did. Thanks for the comment! Thanks Emily. I think we need to equate it with a tool. So, when used well, technology is a powerful, helpful tool. When used poorly, it makes you a slave to it. Like with any tool, it needs to be put up when not using it. Best wishes on your discussions on class. Betty Friedan touched on this way back when as well. Her theory was that housewives (now: homemakers) increased the amount of work they did to fill the amount of time they had, despite all the time-saving technology. What seems obvious but that I hadn’t thought of, was what Cowen said about still needing the bakers, the agriculture, and all the other marketplace positions to supply each individual home. This makes the home an industrial unit no different than an office or a clearinghouse and it’s interesting that society still views the home as private sector or less involved with industry than industry. Nice post. There really is a lot to notice about women as producers, rather than just consumers. Did Friedan mention the similar ideas in The Feminine Mystique? It has been so long since I read that one (and I failed to take good notes at the time) that I don’t remember! Great connection. It’s so true! You are home, but you are so busy doing for others and maintaining technological systems that there’s no time for you to do your own stuff. It is frustrating! Thanks to Emily for writing about this book. I admit that it continues to bother me that homemaking is not considered as contributing to the economy/society, unless you are paying someone else to do the work. I hope to read this book someday. Thanks for the reblog! I hope you get a chance to read this one. My professor talked about this a bit in my American History class. He said another thing that changed was the notion of cleanliness. When people in the past said “cleanliness was next to Godliness,” they meant it in terms of order and everything being in its place. In the 20th century, cleanliness began to mean sterility, free from bacteria. Suddenly, it wasn’t enough to have an orderly home; women had to sterilize their home as well. Though it feels like a stretch as I’m writing this, I feel like I need to mention how this article reminded me of a conversation I overheard on ‘The View’ yesterday (I believe) about offering The First Lady of the US a stipend or salary like the President (not comparatively ‘like’ but similar to the fact that the president is paid, so should be the first lady). There were detractors, saying the first lady is the wife to the man holding the position. It ties in to your statement that women aren’t producers in the home, and it made me angry to hear that The First Lady shouldn’t get a salary because her husband already gets one. To think about all the things First Ladies do in the office (think Eleanor Roosevelt, Jackie Kennedy, and Hillary, as just a few) and to even think about — let alone say out loud — that the First Lady shouldn’t be compensated for the time and effort she puts forth, only because her husband is already paid, kind of makes me feel like it’s 1954 rather than 2014. Women do an awful lot of unpaid work. Yesterday, I discussed with colleagues the idea of emotional labor, and how that is almost never valued nor paid for. Great addition to the discussion! Emotional labor! Yes, I never thought of it like that, and it offers so much not just to a work place but a functional and successful home life. It is truly important to discuss how elements of successful business and personal lives come from paying attention to much more than just the bottom line. Great article, Emily! Emily, I very much share your review of the book. Great work. Would you however share your references(full references) in your next posts so that we can go to them for further/ other researches? Thank you! !